1. How much did the kit cost and what exactly did it contain? 2. How much did your engine cost and what spec did you go for? 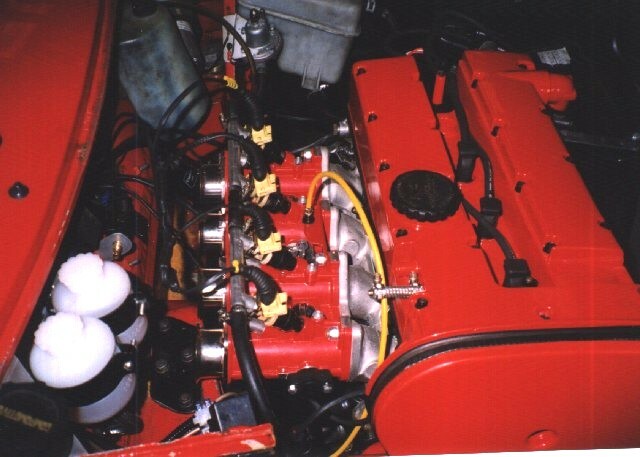 "The Vauxhall engine cost me �0 it came with the alternator, starter and the fuel rail inc injectors. It is bog standard. A complete gasket set cost me � ! I've only used a couple of the gaskets yet." 3. What other parts did you have to supply to fit the engine. 4. 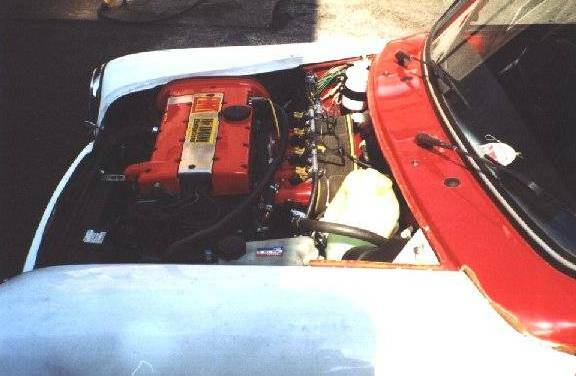 How easy is it to fit the engine and sub-frame? "The sub-frame took about an hour to fit. The engine and box took about the same. 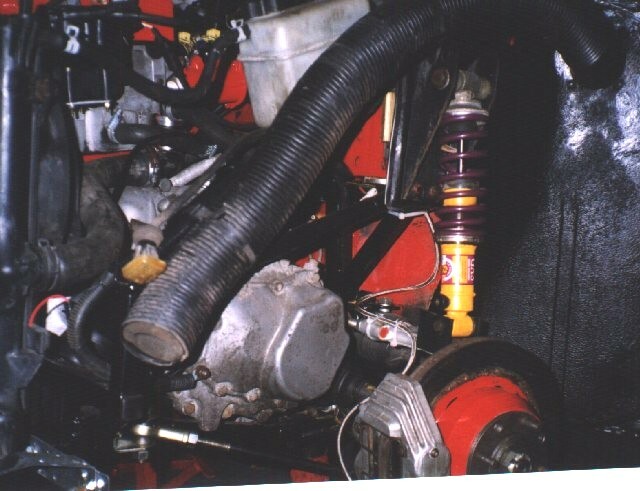 The plumbing in and fitting up of the engine ancillaries is still ongoing." "Cut off everything from the A panels forward. Drill holes for the brace bars and the bottom chassis legs." 6. How do you mate the Vauxhall ECU to the Mini wiring loom? "You don't. I used a DTA ECU to control my throttle bodies. Andy supplies all this kit inc a custom loom." "You don't, although Andy said someone had done it. Use a Vauxhall gearchange and linkage, adapted to fit." 8. How much do you think it's cost in total? "A fair bit, it depends how much you want to spend on the fueling side of things, it would be much cheaper to use carbs. Buying a complete salvage Astra/Cavalier etc. would be definitely the best way to go. I had to scrat around all over the north of England finding the bits I wanted, as decent scrap yards or performance breakers don't seem to exist in Cumbria." Get clearance for the gear linkage as soon as possible, don't leave it too late. All the other conversions I have seen (VTEC/Vauxhall/Suzuki/Ford) have been far inferior to AMT's product." Finally - a shot of a completed Vauxhall-engined Mini complete with the lengthened front-end. I reckon once the front's painted to match the rest of the car the extra length's not going to be too obvious. And here it is with the front-end sprayed. Very nice don't you think? Another view of the lengthened front-end. This shows the Vauxhall gearstick and linkage in the normal Mini position which has been blanked off with a piece of plate. The rod has been butchered a bit but that can be tidied up at a later date. 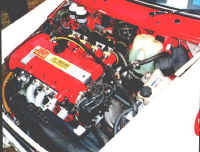 Engine bay shot showing how compact the installation is. 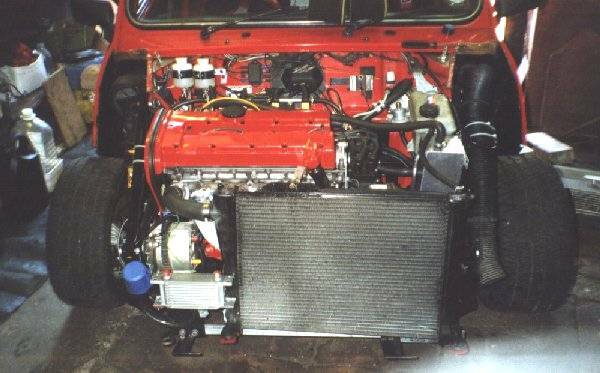 Note the distributor and radiator. Drivers side. You can see the frame brace bar this time, you can just about make out the hinge bracket for the front end just to the right of the towing eye. The manifold will be fully wrapped later on. Passenger side. 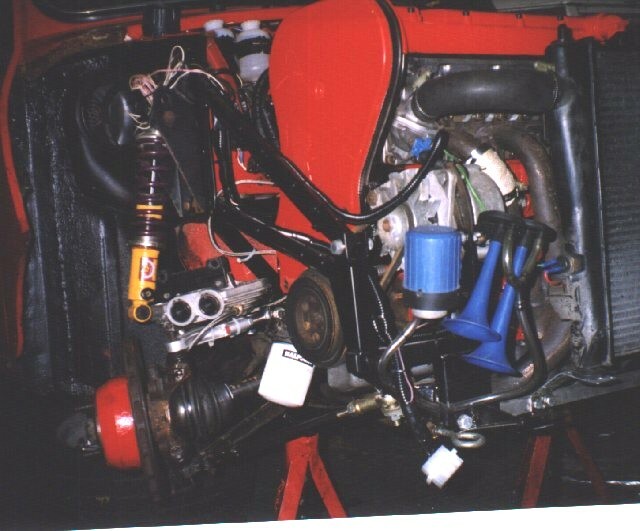 You can see some of the frame, the rose jointed tie rods, the gearbox in the centre and the rad to the left. 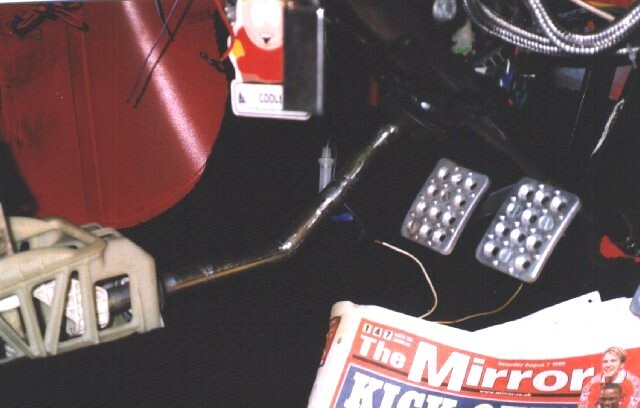 The DTA ECU sits behind the dash, out of harms way. 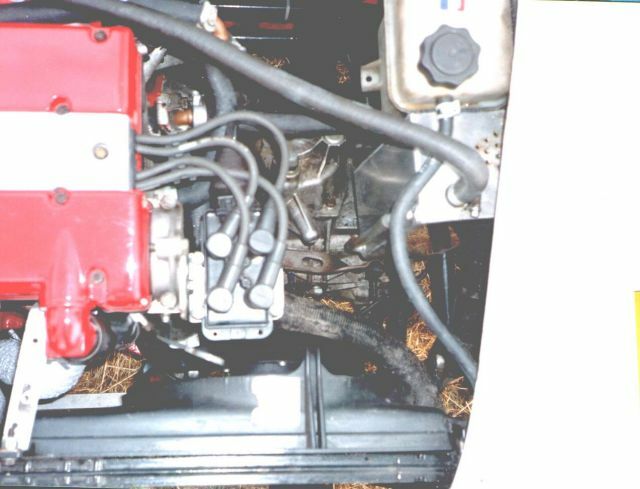 Engine bay shot, showing the throttle bodies, new brake fluid reservoirs, the thing on the middle of the bulkhead is the air temp sensor. 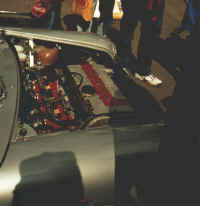 A full engine bay shot. I decided on the Vauxhall conversion primarily because of the performance for your money. The AMT demo car at the time was doing the standing quarter in 12.34 seconds and a top speed of 147.5mph. The reason for the AMT sub-frame was the fact that its not a modified metro one. The sub-frame is purpose built for the mini and Vauxhall engine. Also the sub-frame was designed on British aerospace computers, by a stress engineer. The reason for the Vauxhall engine was that tuning is very cheap, 220bhp is a lot cheaper from the Vauxhall than the VTEC. Also, in terms of weight, there isn't that much in it as the VTEC exhaust manifold weighs so much. The only doubt I had was the longer front end. I know that it all fits into the clubman front, but I prefer the round nose. 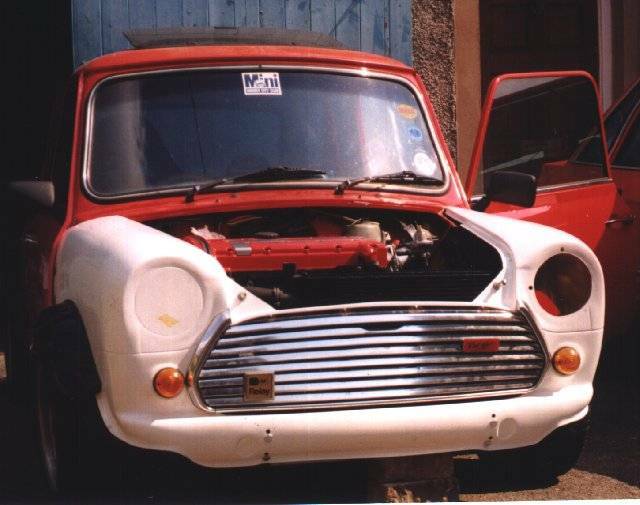 Anyway, even with this doubt I chopped the front off my mini. It was not until I had the painted front end on the car that my doubts were silenced. The front end doesn't really look any longer ABS have done a great job. Mini fans will notice on second glance, but non-mini owners have no idea. I have had to prove it to a number of people who did not believe that the front was longer. In terms of spec. The engine is a standard Astra GTE. The con rod bolts have been replaced with ARP ones to enable higher revs. 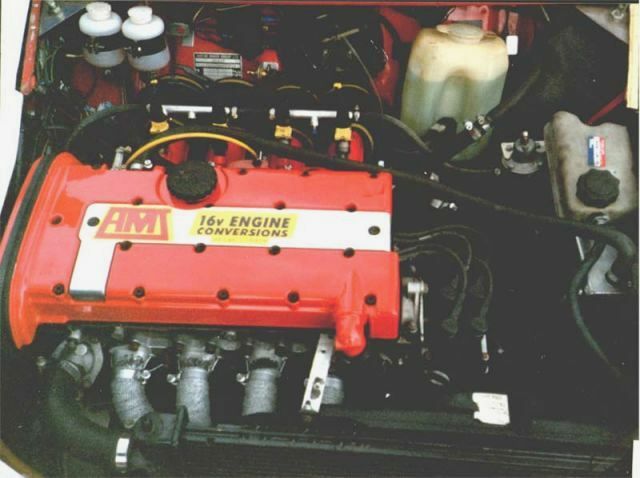 The 16v cylinder head is totally standard. The exhaust manifold is standard GTE and is mated to a Mini-Spares big bore system (Neil Booth or Rich at Mini-Spares north will remember the exact system). 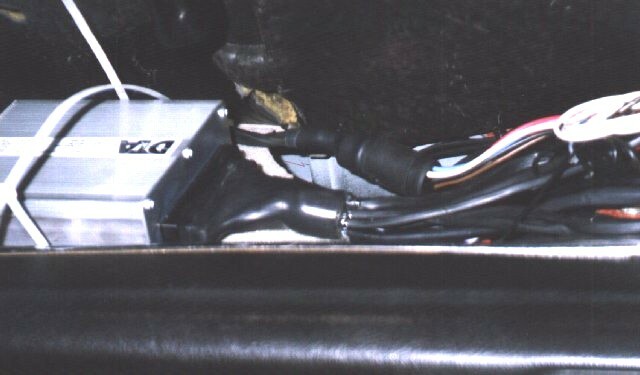 The inlet manifold is from SB developments and the throttle bodies are from Jenvey. The management system is DTA and comes with launch control etc. The injectors are standard Vauxhall (good for 220 bhp). In terms of wheels I'm using 7*13 Superlites and 165 Yokohamas. I think that anything larger will put too much stress on the rear trailing arms, but that's only my view and I have no evidence to support it. 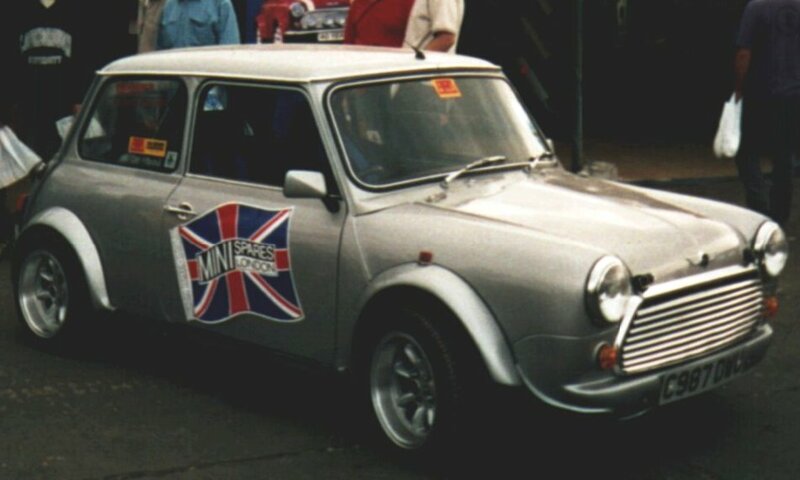 This picture shows Paul's Mini at a recent show. Wonder if they know what's under the bonnet? They do now! It's official, a round-nosed Mini with a modern 16 valve engine. From this picture, it's a neat installation and almost looks like an easy fit!